Not all marinas are created equal. Some are gruff places with basic services, while others cater to the super rich, or families, or locals, and so on. All marinas, however, host some type of ecosystem at the edges and in quiet moments. For most boaters, interaction with this ecosystem might be limited to cursing at the sea gulls, pelicans and geese who crap all over your deck minutes after washing down the boat. Its not all harmony and rainbows. During this trek down the coast, we have experienced marinas during the low season, when boat traffic (and associated negative environmental impacts such as excess oil, nutrients and other nasty marine products) is relatively low, and the docks are even more accommodating for wildlife. So I have been observing the components of marina biology…and letting Fabio deal with the guano. 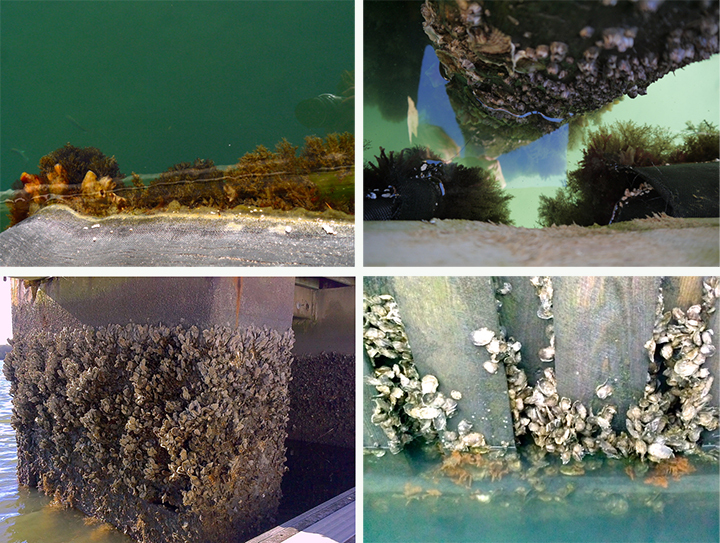 On floating and fixed components of the dock structures, we see intertidal populations of oysters, barnacles, tunicates, sponges, algae and so on. If the structure is fixed, we use these striated populations to monitor the tide (SPOILER ALERT: a few barnacles visible = high tide; barnacles, oysters and sea squirts visible = low tide!). If the structure is floating, the encrusted population consistently enjoys a bit of sunlight and inundation…however they are never submerged far enough to be shielded from the poking beaks of egrets, herons and other sharp-faced birds that stalk the dock. Fabio has noted that in many published tales about seafarers and those lost at sea, the human characters often end up deep in conversation with bird companions. 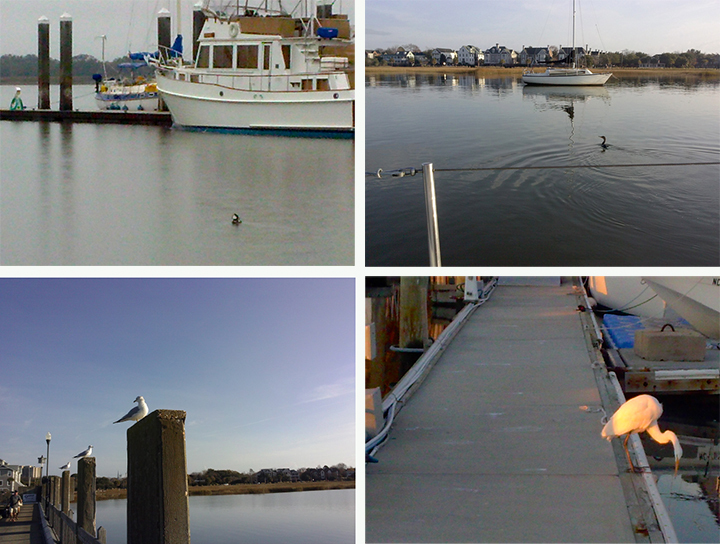 We are rarely without a faithful feathered friend (or several), monitoring the marina for food and resting spots. We recently added a great birding book to our boat library (Thanks, Andy! ), and our first unique sighting was a male Hooded Merganser that skulks around the Dataw Island Marina, where we are now. Not a bad start to our bird list! We have noticed a big shift as we have moved south toward “soft edge”, or intact salt marsh and other wetlands behind or adjacent to the marina and other waterfront infrastructure. 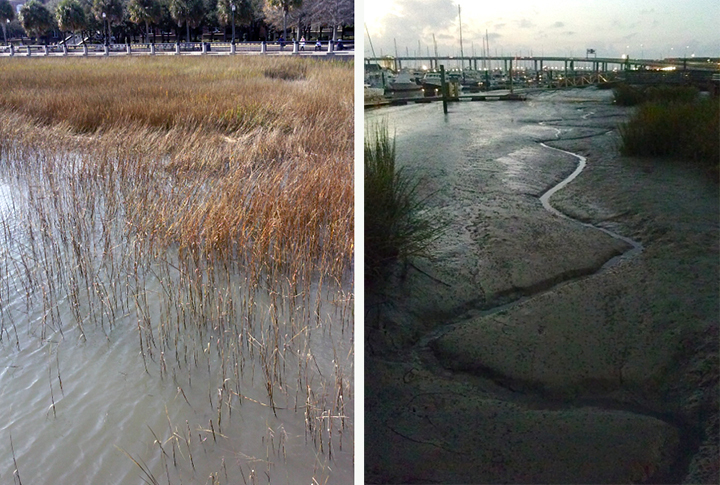 Even in relatively urbanized downtown areas (these photos are from Charleston, SC at high and low tide) soft edge remains intact to provide dynamic life support and erosion control/storm protection to the waterfront users. Whether through correlation or causation, Charleston also happened to be the most dolphin-active marina and anchorage we have experienced so far. We grew so accustomed to the characteristic sigh that accompanies a dolphin surfacing, that we stopped even pointing it out to each other. I never thought I would see a day where a dolphin out the window was not remarkable! this is great! I am learning so much about sailing and the ecosystem. So much fun! Thanks for sharing! Glad you are able to connect with Burnhams and Thompsons! You are currently reading marina biology at plankton every day.